Square the half-square triangles of Border Blocks #1 and #2, if needed, to measure 2” x 2”. On some copies of Mystery Solved, there is an error on page 7, Step 4. The UNFINISHED (edge to edge) size of the block should be 11 3/4". The block measures 11 1/4" when finished. 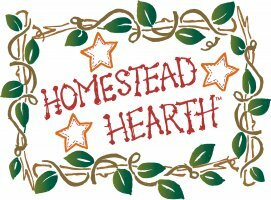 Correction pages have been mailed to all shops so if you purchased this pattern, you can obtain a correction page from your shop or you can email us at info@homesteadhearth.com for a replacement page. The Month 10 illustrated diagrams are correct with regard to the finished size of the HST unit--they finish at 1", 1 1/2" unfinished. Please ignore the written directions that list a different size for this unit. Fabric 1 is the red print, 1012-0114;; Fabric 3 is 1002-0177. Refer to the pattern for information on the triangle border. When attaching borders, quilters often find it convenient to simply make strips longer than the length of their quilt, attach the strips and then trim off the excess at the ends. Although convenient, this can lead to misshapen quilt tops and wavy borders. To make a nice square top, follow these simple steps. The pieced border provided in this pattern is designed to exactly fit your finished top, assuming your seams and cutting were all 100% accurate. Since everyone cuts and sews differently, we encourage you to take a little extra time when preparing your borders so you will be happy with the final result. First, lay your neatly pressed top on a flat surface. To attach the side borders, measure the quilt top’s length in three places – each side, as well as the middle. Take an average of these three values and then measure your pieced border strip constructed from the half-square triangles. If these measurements are within 1/2” of each other, you should be able to sew the pieced border to the top and ease in the excess fabric on whichever part was longer. Fold both your borders and quilt in half to find the middle and mark this spot with a pin. For a large quilt like Civil War Tribute, fold in half again and mark the quarters with pins as well. Matching pin marks, pin your border to your quilt top every three or four inches, easing in fullness if necessary. Sew and press this border. For the top and bottom border, lay the quilt out again on the flat surface. Now measure the width of your top, including the side borders, in three places – the top, the bottom, and the middle. Again, take an average and compare to the length of the pieced borders. Pin, sew and press using the method above. This should leave you with a nicely squared flat top. If you find the length of your pieced border strip and quilt top vary by more than 1/2”, you can either adjust the width of the plain fabric borders or add cornerstones to each corner of the quilt. We used scant seams to piece together the triangles in the rows and these measurements fit together exactly. --Make one 18" and one 12" finished block! A few customer patterns for Month 2 have an incorrectly shaded diagram on step 4 for rows 2 & 5. Please refer to the color picture of the block to correctly line up rows 2 & 5. Step 17. 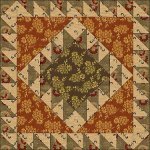 Sew four of the Step 14 HSTs together into a row with the triangles oriented as shown. Make 2. Sew 4 of the Step 14 HSTs together into a row with the triangles oriented as shown. Make 2. Please disregard the reference to a "Fabric 3". In month 6, if you opted to make the small quilt, there is sufficient fabric from Fabric 1 to bind your quilt.